(Nanowerk News) The Frederick National Lab has begun to assist several major pharmaceutical companies in adopting nanotechnologies in early stage drug development, when the approach is most efficient and cost-effective. In its interagency agreement with the FDA, NCL will apply a filtration method invented by Stephan Stern, Ph.D., for measuring drug release from several nanomedicine products. The method allows for accurate determination of how much of the drug is bound to the nanoparticle, how much is free, and how much is bound to plasma proteins. This image is a cartoon illustration of a drug (middle) released from a nanoparticle (left) and binding a plasma protein (right), all in suspension above a filter, with the filtrate (lower) containing only the free drug. 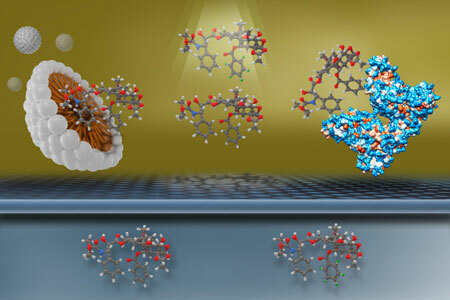 Image courtesy of Jennifer Grossman, Ph.D., Nanotechnology Characterization Laboratory. With Amgen, NCL will build on an earlier collaboration to produce nano-formulations of a compound to enhance its ability to disperse throughout a tumor. Amgen will evaluate these new formulations. In the collaboration with Pfizer, NCL will characterize nanomaterials selected by Pfizer as potential drug delivery systems in oncology and immune modulation.